People go absolutely gaga over French macarons. Over the course of the 10 years I was running my wedding cake business I watched the wave of French macaron popularity swell. Hoping to ride the wave I started selling macarons as wedding favors and for dessert-table displays. I often had to make 200-300 cookies per order, which means baking 400-600 shells. Because my commercial kitchen only had a powerful convection oven it took some trial and error to get a system down to produce those delicate little bites. 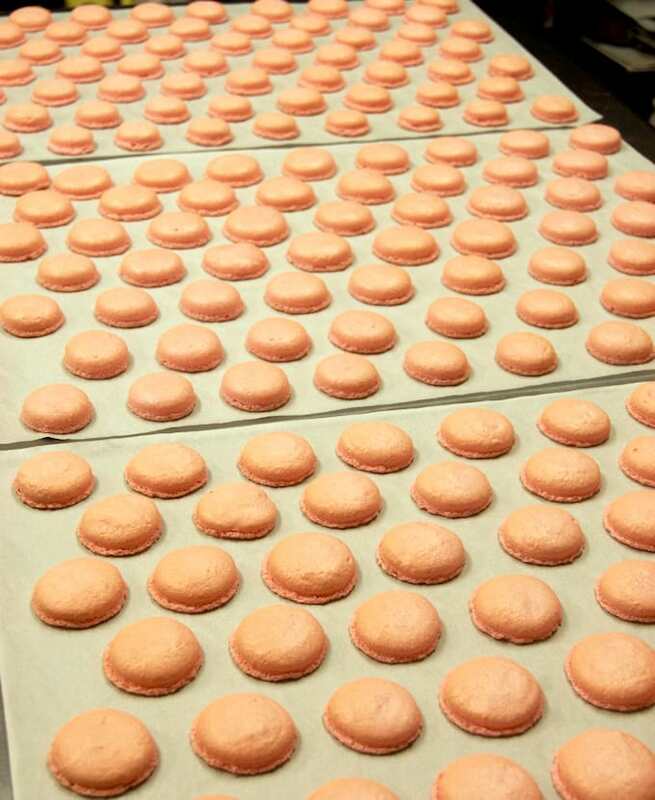 Hundreds of macaron shells cooling in my commercial kitchen. 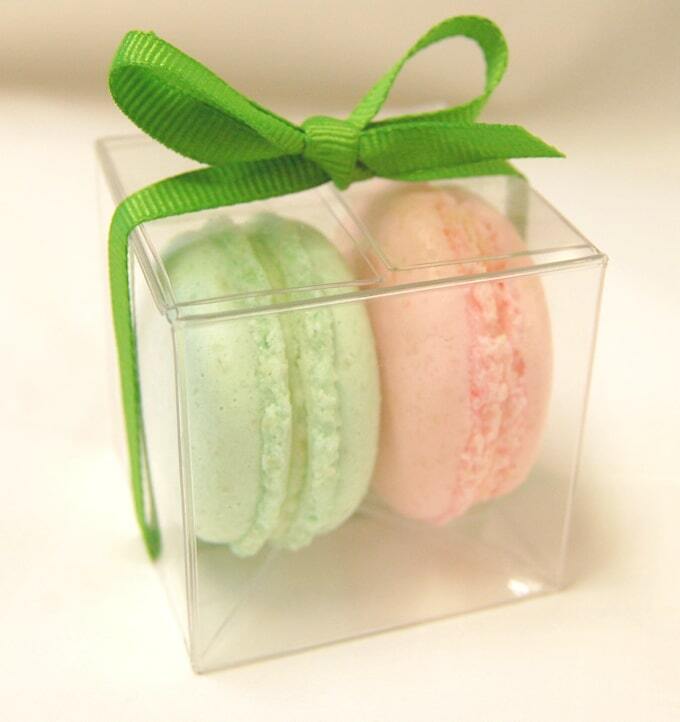 French macarons are the perfect wedding favor or box them up and give them as holiday gifts. 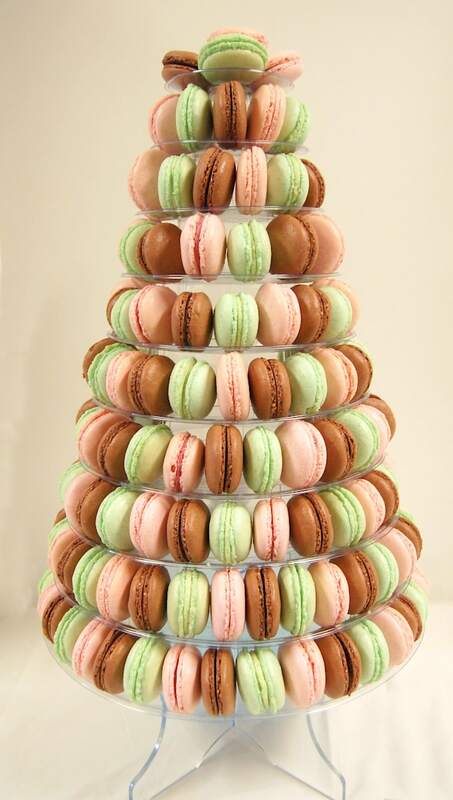 A macaron tree is a spectacular centerpiece for a wedding or holiday table. 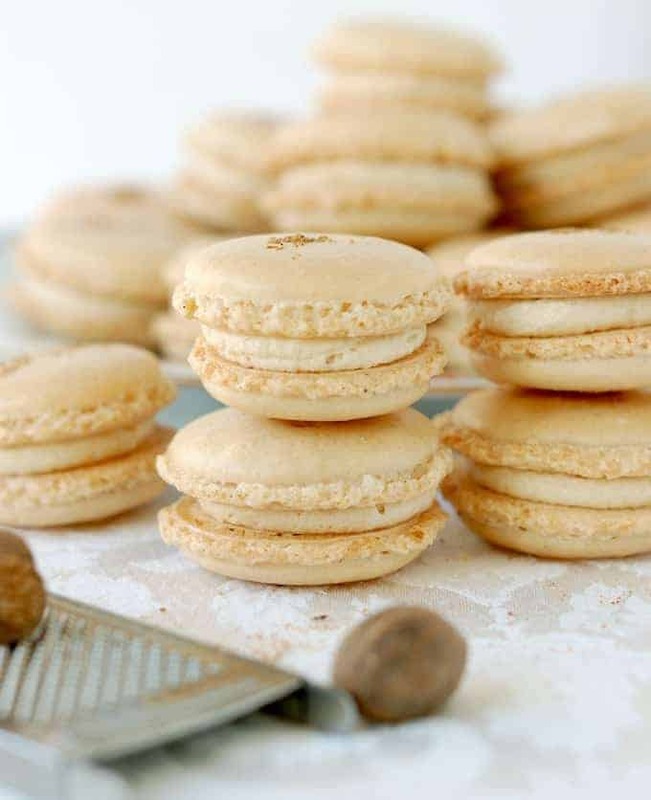 There are no shortcuts to perfect macaron! 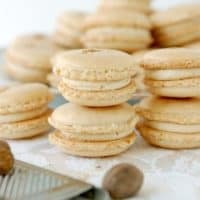 So why I haven’t I posted a recipe for French Macarons before now? 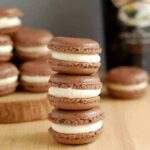 Well, I knew posting a macaron recipe would involve quite a bit of explanation and detailed description because there are no shortcuts to the perfect macaron. Even experienced bakers can have trouble with the admittedly finicky cookies. I’ve given detailed instructions, but you may find that things work slightly differently in your own kitchen. 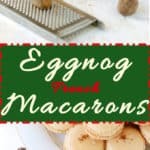 Even when making the Eggnog Macarons for this post I ran into a few problems. First, I had to scale down my recipe to a manageable size for a home kitchen. When I baked the first batch in my home oven they browned way too fast and cracked. Turns out the oven in my house is running about 25°-50°F too hot. Who knew? Most baked goods can take a temperature variation, but it took these fussy cookies to make me check the calibration of my oven. Anyway, once I got the oven sorted out I was back in business. 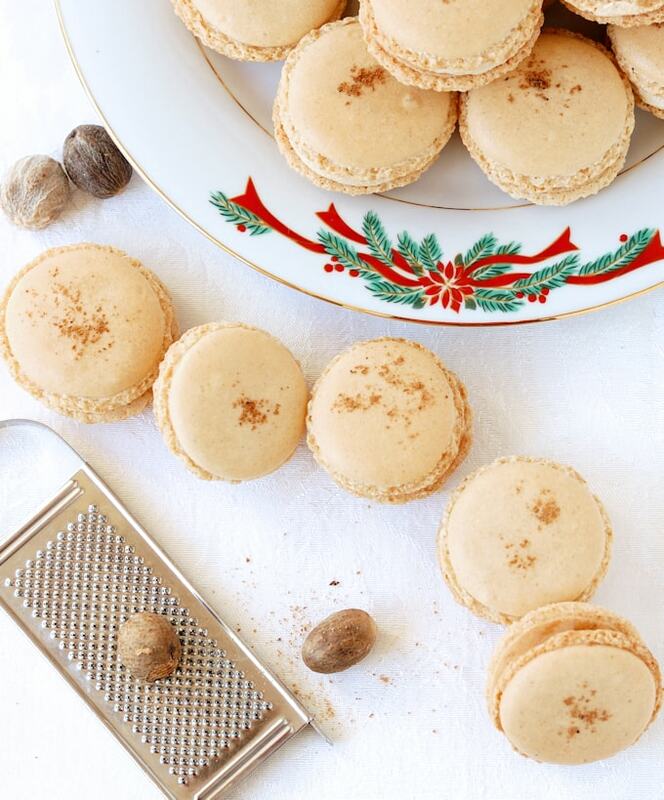 So that brings us back to these delicious Eggnog Macarons. Both the shells and buttercream filling have classic eggnog flavorings. My buttercream filling is a mix of butter and the almond flour base. 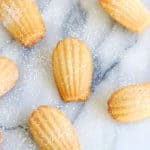 I originally got the idea for the filling from an old French cookie book and I love it because it’s not very sweet and has a great texture. After making literally thousands of macarons I’ve keyed in on the steps that are necessary for the most perfect cookies. Age the egg whites. This is the first and most important step. I’ve tried making macaron shells with freshly separated egg whites and I got cookies with ugly, lumpy shells. Remember, macarons are all about that perfectly smooth and satiny shell. Weigh your ingredients. Volume measures are not precise enough for this recipe. Grind the almond flour & sugar. It may seem redundant since the almond flour is already ground, but I’ve found that the extra step makes for a smoother shell in the end. I’m guessing it has something to do with the almonds absorbing some of the sugar, but whatever it is, don’t skip that step. Sift the almond flour and sugar after processing it. 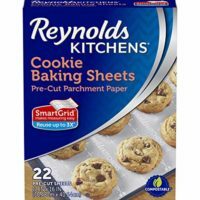 Again, this will eliminate any lumps of sugar or large bits of almond that might mar the texture of the cookies and will also evenly distribute the spices. 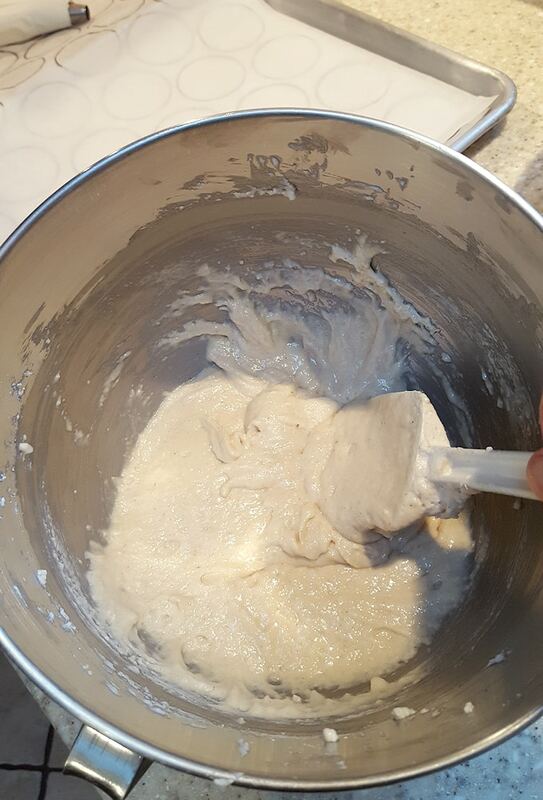 Fold the batter until it’s smooth and shiny. Either under or over folding the batter will result in wonky shells. I’ve found it’s easier to under fold than over fold. Check out the slideshow below to see photos of the perfect batter texture. The whites should be whipped to full peak. Make a template to get consistently sized cookies. Mine are 2″. 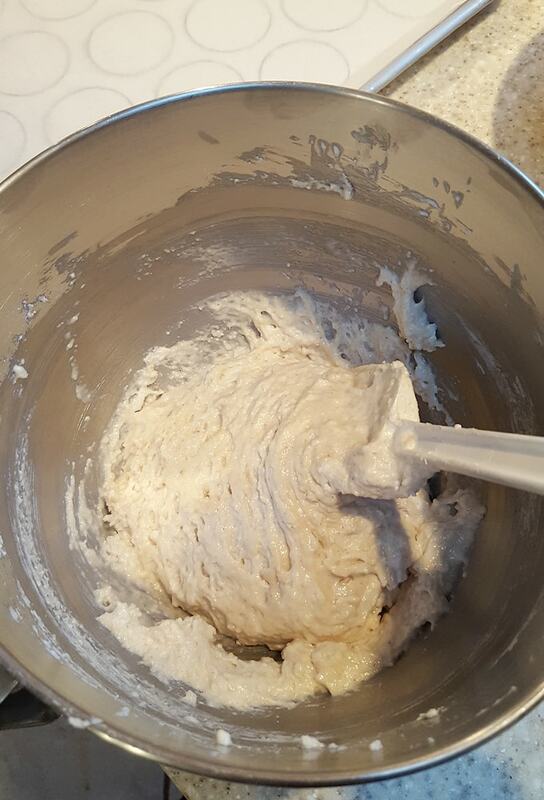 The batter will start out rough and dull in appearance. Hold the piping bag 1/4″ over the parchment. Squeeze with constant pressure without moving the bag. A ball of batter will grow. Pipe to within 1/4″ of the template. The disc will spread to almost fill the circle. Shimmy the top of the cookie. If it moves separately from the foot it’s not ready. If the middle is soft but the top is attached to the foot it’s baked. Will you get edible macarons if you don’t follow all these steps? Sure, they’ll be edible, but why go through all that trouble for an ordinary cookie? Take the time to create something really special to share with your loved ones this holiday season. 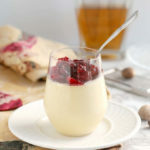 If you like this recipe please consider giving it a 5 star review! French Macarons are really something special. Make them for the holidays with delicious eggnog flavor. 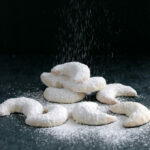 The ingredients for this recipe are given by weight for the most accurate measurement. Divide the base - setting aside 12 oz (340g) for the macaron shells and the remaining for the buttercream filling. Preheat the oven to 325°F. Use a biscuit cutter or glass to draw twenty-four 2" circles on a 1/2 sheet of parchment paper. 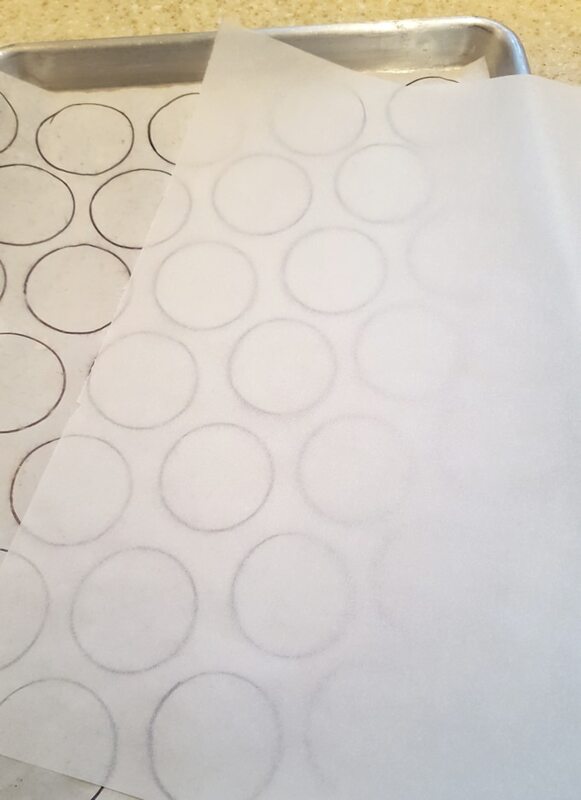 Line 2 baking sheets with parchment paper and put the paper with the circles underneath the parchment on one of the pans. 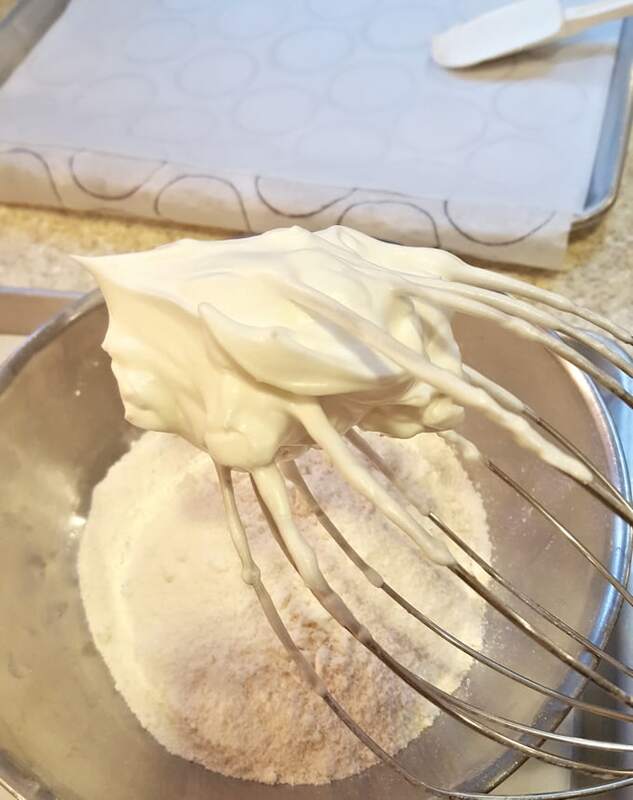 Whip the egg whites to soft peak. With the mixer running add the 1.5 oz of confectioner's sugar and whip to full peak. Gently fold the almond mixture into the whites in two batches. Continue folding until it becomes soft and shiny, but not thin and runny. 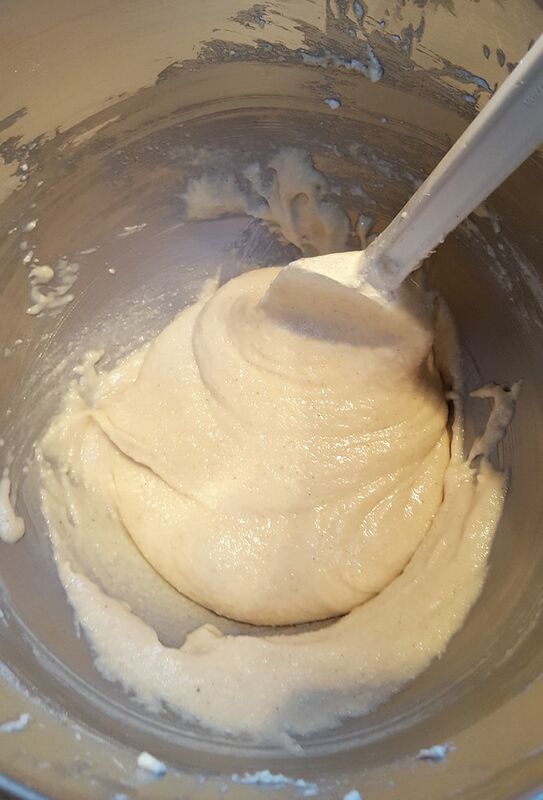 Scoop the batter into a pastry bag fitted with a round tip (or cut the tip of a disposable bag). Pipe discs of batter until until they're 1/4" from the edges of the circles you've drawn. Sprinkle a pinch of nutmeg onto each cookie. Set the pan aside to allow the cookies to dry for about 30 minutes. Bake for 7-8 minutes. 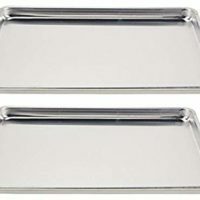 For even baking turn the trays so the back side is at the front and rotate the trays between racks. 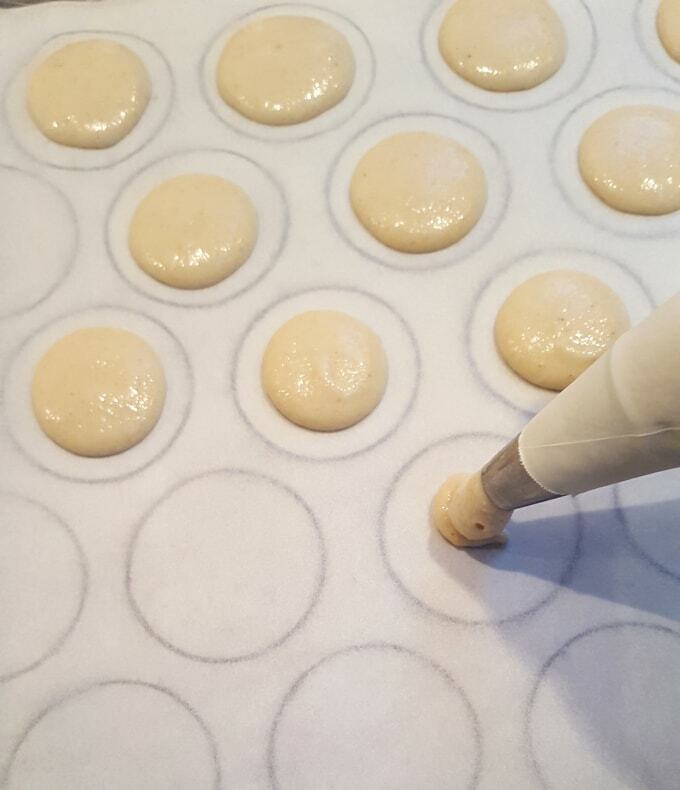 Bake for another 5-6 minutes until the shells are dry and the centers are still soft. Combine the softened butter with the remaining base mix and flavorings. 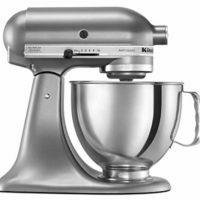 Whip on medium-high speed until the buttercream lightens in color and becomes aerated. 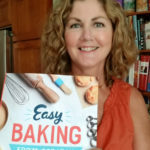 Thank you Eileen for such a detailed recipe! I bake a lot but I’ve always shunned away from trying to make macarons. Can’t wait to try it now! 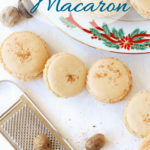 Perfect flavored macarons for the holidays! They are gorgeous!!! Your macarons are stunning! I can’t believe how many you make. I ALMOST went that route, but I am also making some tangerine dark chocolate ones for 12 Days of Cookies and know the hubs would KILL me if I made two batches in the same weekend. I love making these finicky cookies! It’s such gratification when you see the le pied or the feet and nice smooth tops. I LOVE making them, but you’re right in the temperature thing. That’s a deal breaker. My goodness, they look so PERFECT! Oh wow! These look amazing! Nicely done! These are not easy to make. Or at least, not easy for me! ha! Just a word: gorgeous! I love baking but haven’t attempted macarons yet. If/when I ever decide to make them, your post and tips will be my reference. Thank you! These are truly impressive! I’m sure it takes a bit to master the technique. 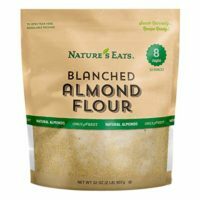 What really surprised me is that it uses almond flour. That is good news for those sensitive to gluten. Love the tip about aging the eggs. I’ve never made macaroons. These look lovely! Thanks Monika. 30 years of pastry experience helps, but using a template with the circles drawn helps keep the sizes consistent. 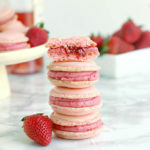 Hi, I will be catering a formal event and would like to make these gorgeous macarons. Your instructions say they can be frozen, what is the process to unthaw them? Also,can they be stored at room temperature or should they be refrigerated? If so, how long can they be refrigerated? I have cakes, pies, chocolate dipped strawberries, and cupcakes I will also be preparing, so I’m trying to prepare ahead if possible. Please advise and thank you. Hi Kay. I used to make macarons as wedding favors when I had my cake business and would work a week or two ahead. I would say up to 3 days you can store them in the refrigerator, longer than that put them in the freezer. To store them, line them up in plastic containers. Place sheets of parchment between the layers and work carefully so they don’t crack. If you’re going to freeze I suggest you also wrap the container in plastic wrap just to make sure no freezer smells get into the container. Unwrap the container and let them defrost either at room temperature or in the refrigerator. I always store macarons in the refrigerator until I’m ready to serve them. In fact, they need at least a day in the refrigerator to “ripen”. Personally, I kind of like them cold, but you can let them come to room temperature for serving. 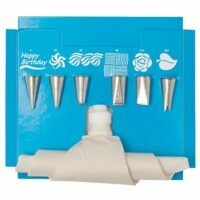 They’re also easier to set up on a display when they’re chilled since the filling is firm. 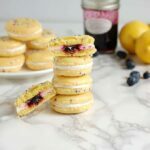 I don’t know if you’ve seen them, but I also have recipes for Lemon Blueberry Macarons, Strawberry Rose Wine Macarons and Chocolate Bailys Macarons. Thank you Eileen! 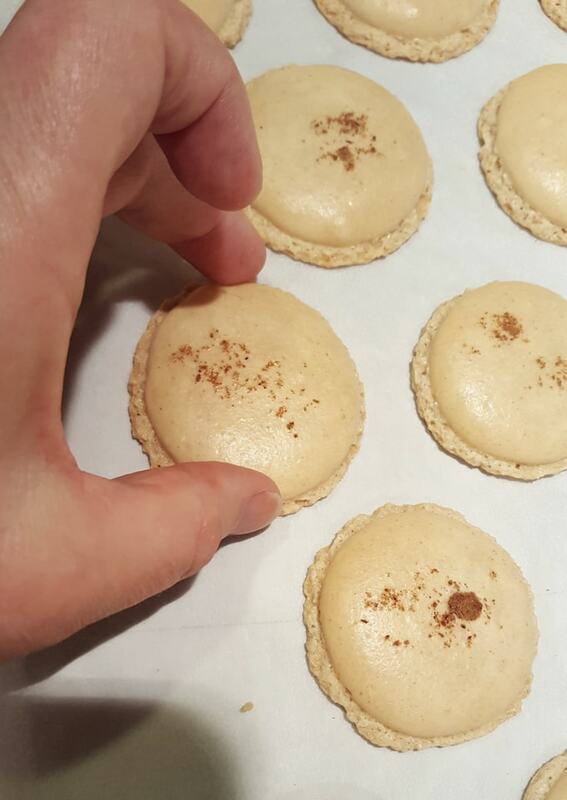 I made these Eggnog macarons last night. It was my first attempt at making them and my first time using a digital scale, so I was nervous. 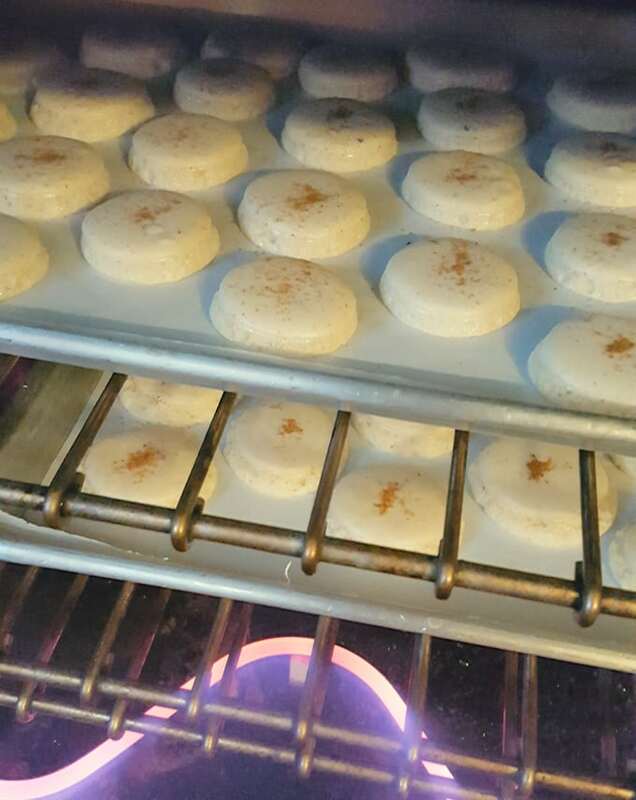 However, when I removed the macarons from the oven I cried — with pure joy! They were simply gorgeous with the ‘foots’ (or should I say feet)! The only thing I must work at is handling them without cracking them or making depressions. 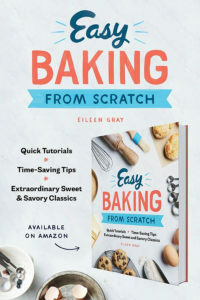 Thank you again Eileen for making baking easy. You’re the best! Yay, macarons can be finicky and, yes, a bit fragile! Enjoy!